One can also use other higher aldehydes. One adds to both test tubes 4-5 drops fuchsin sulphuric acid. In one test tube one adds a drop of propanal, in the other a drop of formalin 1%. In each tube a violet color results. Now one adds 2 ml diluted hydrochloric acid to each. The color of the formaldehyde soon becomes more intense, that of the propanal becomes much paler and bluish. The diluted mixtures can be discharged into the drainage. 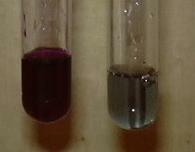 The color of formaldehyde (left) becomes more intense, that of propanal(right) pales.